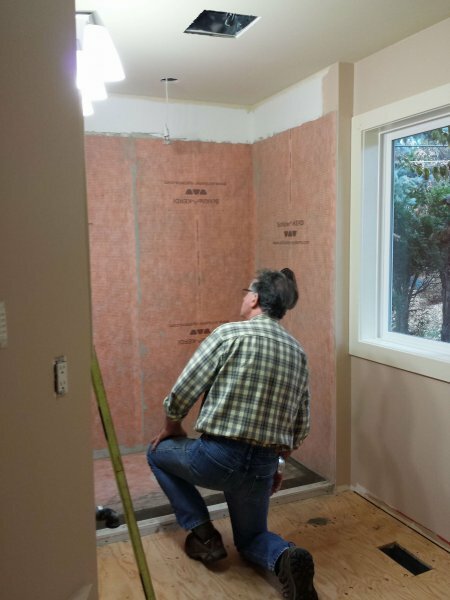 George is hard at it again: this time taking out the old style bathtub/shower combination and putting in a large walk-in shower with rain-head. He is doing the tiling himself this time and going through a learning curve of all the new materials available to “speed up” the job. He watches a lot of You Tube videos on “how to” use schluters, membrane, thinset, etc. Still learning after all this time! Good for him! He expects this new addition to the Blue Iris B&B to be ready by Christmas this year! We are also changing up the color of the walls in both the bathroom and the bedroom too; going for a more soothing cafe au lait color which will broaden the colors of quilts I can make for that room. Watch for it!